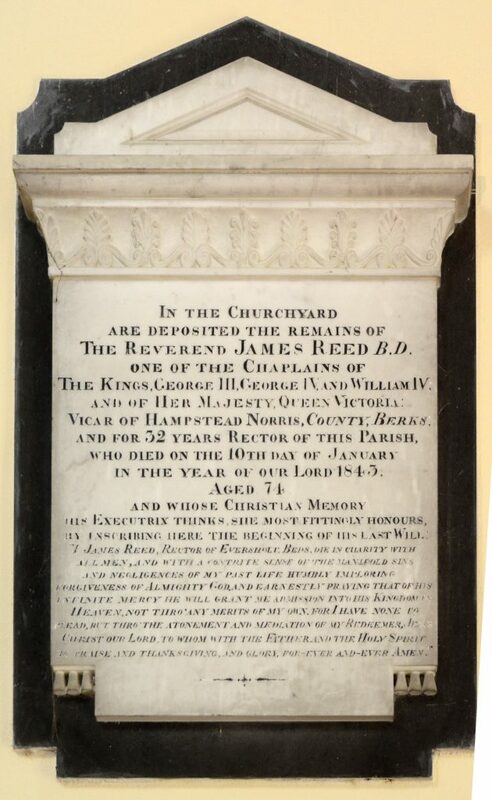 In the churchyard are deposited the remains of The Reverend JAMES REED B.D. One of the chaplains of the Kings GEORGE III, GEORGE IV,and WILLIAM IV and of Her Majesty QUEEN VICTORIA Vicar of HAMPSTEAD NORRIS, COUNTY BERKS and for 32 years rector of this parish who died on the 10th day of January in the year of Our Lord 1843 aged 74 and whose Christian memory his executrix thinks she most fittingly honours by inscribing here the beginning of his last will. Much more about James Reed is on this page.